SHARKENSTEIN begins with an opening from World War 2 where a pair of scientists are trying to make sharks into killing machines that will help win the war. The Third Reich learn of this experiment and aim to take control and use said creatures for their own aims. 60 years later in a small harbour town, bodies are washing up on the beach leaving the police scratching their heads as to what is the cause of the deaths. It transpires that a mad Nazi scientist is continuing the experiments from 60 years ago, but is creating a super shark with different parts of several sharks. Adding into his creation the heart and brain of Frankenstein's monster as these are said to be indestructible. 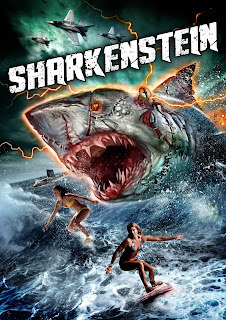 Only the harbour master and a young girl have figured out what is going on and can save the town from SHARKENSTEIN. If you have seen any films from Mark Polonia previous to this one you know what you are in for: cheesy one liners, B-movie style acting, cliched dialogue and one dimensional characters, but hidden amongst all of that is a fun film that knows what shoes it has to fill. A nice nod to Frankenstein films of Hammer and Universal are mentioned throughout, and we even get a little history lesson from one character who loves the Frankenstein story. SFX are mainly done by Brett Piper (QUEEN CRAB) with his usual use of stop motion animation and puppetry skills. The shark itself does look very effective in its underwater scenes with its stitched up look and when it gets hit by lightning later in the movie it becomes something else that is worth watching for. Utilizing most of the principal cast from his previous movie BIGFOOT VS ZOMBIES, Polonia brings his own flair of cheese to the Frankenstein story in SHARKENSTEIN. "I had nothing to do with the effects in this movie beyond building the puppets. Mark and Anthony Polonia actually created all the effects." Thanks to Brett Piper for clearing this up.